Good Keen Librarian: Talking like Pirates, Minion Bookmarks, Book Fridges and More! An enthusiastic primary school librarian and ICT coordinator talks about libraries, using technology and implementing new ideas. Talking like Pirates, Minion Bookmarks, Book Fridges and More! Now that my presentation at the SLANZA conference is done and dusted I thought I'd go over our very busy last couple of weeks of Term 3. On 15 September we celebrated International Dot Day in the library. This is based on the lovely book The Dot by Peter H. Reynolds. We had the iPads out and asked anyone in the library if they wanted to make a dot using a drawing app. I deliberately didn't publicise it as I knew we'd get too many students then. As it was, as a random pop-up art activity at lunchtime, we had just the right amount of students. A student from my Clever Minions advisory group read the book and then several helped younger students learn how to use the app. Here's our Facebook album of the event. I sent the completed dots through to thedotproject.org to go on their gallery but they haven't appeared there yet. It was an enjoyable lunch time, it is amazing how creative students can be when making a dot! On Friday 18 September we had the launch of a coffee cart outside our library. This was an initiative from the PTA, but they involved me as thought they might be able to help us increase the number of parents who use the library when it opens on Friday mornings before school. As the coffee cart was going to be up and running by 8am we decided to open the library earlier to coincide with that (it used to open at 8.30am). Friday the 18th just happened to be the last school day before Talk Like a Pirate Day (officially on the 19th). I've been meaning to celebrate this day for a while so it felt like a good idea to combine the launch of the coffee cart with a little pirate celebration in the library! Esther and I dressed up like pirates and I bought some eyepatches for our student librarians to wear that day. I found an app that transformed our students into pirates, we played some pirate music and had all our pirate books on display. And of course we all said "Arrgghhh!" and "Shiver Me Timbers!" a lot. At morning tea on that Friday I taught the Exploding Minions book club how to make minion bookmarks. These are so cute! It was a great way to road test the activity before running it over a lunchtime. We discovered that we needed a lot more glue sticks and that it would be easier to have some of the paper pre-cut. Then on the last Monday of term we gave lunchtime library visitors the opportunity to make their own minions. We had some of our Clever Minions group available to help but even our youngest students were able to make most of this by themselves. We had students turning up later who we had to turn down as the activity takes a while to do. I told them to get their parents to look on Facebook as I posted the video on there for those who missed out. Here is the Facebook album for this, it had a reach of 548 people, which is very big by our standards. Oh, and I will mention the name of one of the books on the fridge, "written" by our principal - Mr Sheedy's Guide to Ballet - and how to look good in a tutu. Hehe! On the last Tuesday of term I visited our public library to talk with their librarians and swap ideas. I got so much out of that visit I'll do a separate post on that. We finished the term with another coffee cart visit, we've had six more parents sign up to borrow books so far, so that has been successful. a book fridge! in some of the empty spaces. I made sure to get my copy of Canterbury Quake signed by Desna Wallace while I was at the conference. If you haven't read this, it really does give you an insider's experience of the quakes, I highly recommend it. You have some great ideas here. I'm always on the look out to see what other librarians are up to. 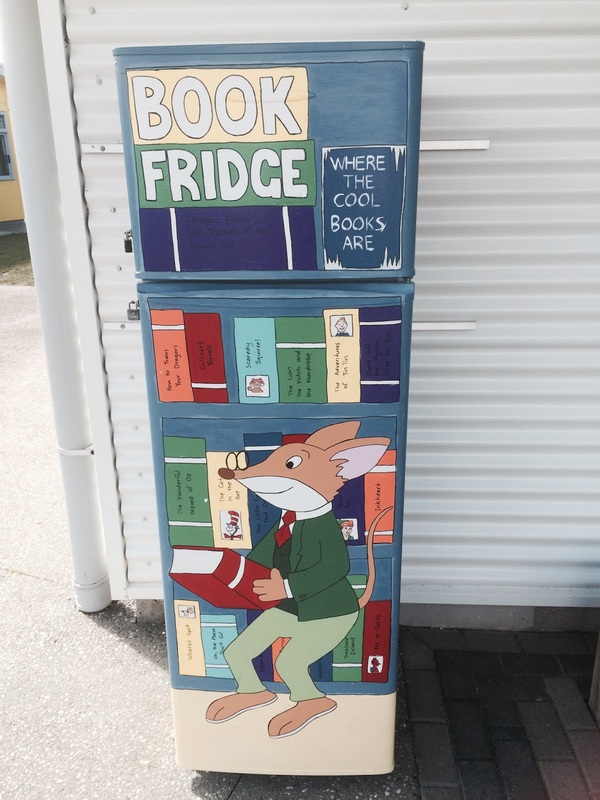 Although time to put new ideas into action is minimal (I'm a class teacher too), your lunchtime art and 'cool book' fridge will be at the top of my list! Don't forget to get parents involved. That's how I got our Book Fridge painted. I wouldn't have had the time, or the skills, to do that myself! I think when something is fun it's easier to get helpers.